I spent quite a bit of time researching options for a mortise and tenon jig. 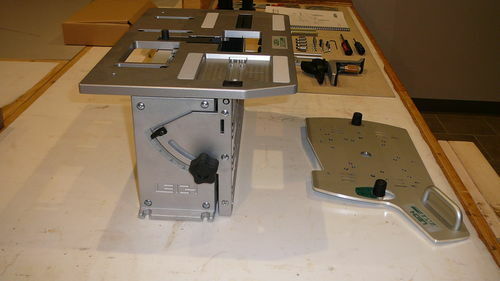 In short order, the options were narrowed down to the Festool Domino or the Leigh FMT Pro M&T jig. As part of the final review I asked the LJ forum what folks thought of both tools. Responses were evenly split between them. I finally chose to go with the FMT Pro. Overview: 4 Stars – I was able to make very accurate, tight and repeatable mortises and tenons even with double angles (5 stars) but expensive and limited accessories left a bad first impression (-1 star). I ordered the jig and all of the accessory guides and various sized bits from Woodpeckers. Total cost was right around $1500, certainly not inexpensive. However, I own a Leigh dovetail jig so I knew what kind of quality to expect. Generally, the FMT Pro lives up to its reputation as the best M&T jig out there. The manual is extremely well written and thorough. There were a couple of things that could use a little more explanation such as the left and right fine-tuning pins and the odd-sized M&T procedure. The heart of the FMT jig is the guide plate. In the simplest terms, the FMT uses these guide plates to make various sized mortise and tenons which makes me question Leigh’s choice to provide the 5/16” guide set as the standard set that comes with the jig. Although when looking at the cost of the additional guide sets in more typical sizes, ¼” ($92 for 8 guides), 3/8” ($52 for 4 guides), and ½” (52 for 4 guides), I have a feeling it has to do with selling the very expensive guide sets and different sized bits after-market. Fortunately, I ordered the extra sets and bits or else I would have had to go through the hassle of ordering the sets I actually needed and waiting for them to arrive before I could use the jig. The guides sets are limited on different lengths (for example the 3/8” x 3/4” and ½” x 2-1/4” guide plates are not available). The procedure provided to make off-sized joints works well enough but it is rather involved and requires making spacers, switching between bits, and using the more advanced procedures that require a thorough understanding of how the jig works. The manual also includes a table to show all of the configurations of bits and guides to make a wider variety of thicknesses and lengths. That’s great for the occasional odd size but I would hope for more guide plates in standard sizes to keep the process simple and less time consuming. I would have also expected Leigh to have included more than 4 guides in the 3/8” and ½” sets, even if doing so drives up the cost. For example, the 1/2” set should include guides at 1/4” length intervals rather than 1/2” length intervals. When spending this kind of money, I wouldn’t expect to have to use the procedure for off-size joints on the first mortise and tenon I wanted to make (3/8” x3/4”). Unfortunately, that is what happened. The second mortise and tenon I made was also not in the guide set (1/2”x 2-1/4”). Once I got past the special set up, I was able to safely make highly accurate, tight mortises and tenons. The base unit is screwed to a support board. The board is then clamped or screwed to the bench top. The base unit needs to be well secured to the bench as it is top heavy and leans out over the edge of the bench to accommodate the boards being cut. The jig requires a plunge router base that can be attached to the router sled using one of two methods: hold-down rods through the fence rod holes in the router base or directly screwing the router base into the sled. The manual has a comprehensive list that shows all of the routers that are compatible with the sled. There is also a procedure to use if your router isn’t on the list. Most routers use the fence rods to hold the router in place. Again, there is a thorough procedure with plenty of pictures in the manual. The procedure also walks you through the process of centering the router base on the sled. There are also a couple of really stout clamps for holding the board securely on the jig, and an adjustable side stop fence. There are also t-tracks so that the clamps can be move to accommodate different sized wood. This is a great feature as it makes securing the pieces in the jig much easier. For both mortise and tenons the center of the tenon is the only mark that needs to be made on the board. The board is butted up against the joint aligning sight and clamped to the clamp plate. 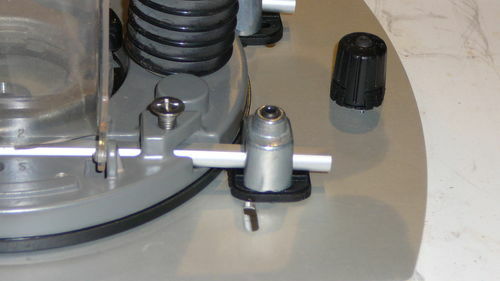 The jig table is moved to center the center mark in the joint aligning sight and then the table clamp is locked down. There are also front/back limit stops and left/right limit stops that can be used for more advanced joints. The adjustable side fence squares up perfectly which makes set up much faster since you won’t have to worry if the board will be perpendicular to the top. As I mentioned before there are a couple of clamps that can be moved around in the slots to hold the board firmly against the clamp plate. It took a bit to figure them out and get them to work properly. Both of these are great features. 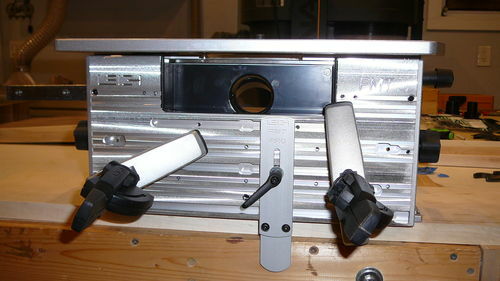 The clamp plate can be angled up to 30 degrees. Set up was fairly easy using a Wixey digital angle gauge. The side fence can also be angled. Angled set up was more difficult as the quick release screw on the fence was a challenge to tighten while holding the Wixey against the fence. There are 2 pins on the bottom side of the router sled. The right pin sits in a slot that is parallel to the front edge. The left pin can be moved around in a recessed area where the guide plate is snapped into place. For the mortise, the guide plate has a slot for the left pin to slide along. The tenon is cut by tracing the outside edge of the guide plate. Adjustments to the thickness of the tenon and the width of the mortise can be made using the fine-tuning knobs on the pins. Since the pins and the guide plate edges are both tapered, adjusting the height of the pin allows for incredibly fine tuning of the fit. It took some time to get the perfect size and fit on the first joint I tried but after it is set, the rest of the joints went much faster. At first, I thought the adjustment knob on the left pin was used to adjust the tenon and the right pin was for the mortise. I’m not sure, and the manual isn’t clear. For better or worse, I cut the mortise first, with the fine -tuning knobs set for a narrow width, make adjustments to the right pin to get the width correct, then make the tenon, adjusting the left pin to dial in the fit. The general set up procedure is reasonably intuitive so after a couple of times of switching between guide plates and bits to make different sized mortise and tenons the procedure is easy to remember. The dust collector on the back of the base unit readily hooks up to a standard shop vac. Dust collection was OK, but not great especially when making the tenons. Most of the chips and dust wound up on the floor below the jig. 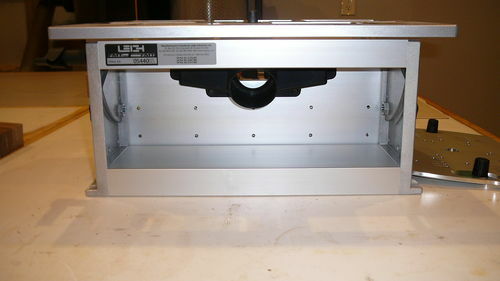 There are probably plenty of thing I forgot to include but you can find numerous Youtube videos, on-line video reviews, and Leigh’s product videos that show off the jig and explain it in much better detail than I have. All in all, I was very pleased with the quality of the mortises and tenons. Set up time was complicated and time consuming because of a lack of guide plates for the sizes of mortises and tenons I needed. Next time I will make sure the mortises and tenons I use on a project are included in the guide plates. Was it worth the cost? Mostly, though Leigh could have thrown in a couple more guide plates for the high cost. Holy smokes $1500 seems astronomical for what you get. I don’t mind spending money on a good tool, but I could never get on board with this one. I paid half that on a floor mortiser and a premium dado blade. I need to make square mortises for the projects I make, so the FMT and Domino were ruled out right away. Once you decide to invest in Leigh or Festool tools, it is a slippery slope. I am in deep on my Leigh dovetail jig, and I don’t like it one bit. I reach for my Akeda instead (also expensive and no longer made). I imagine I’ll own a Domino at some point (for blind M&T joints), but for me nothing beats integral tenons. If you can make repeatable joints that fit well with the FMT, I bet it will be a good tool for you. Thanks for posting this review, it certainly helps other woodworkers work through the decision of what to buy for cutting M&T joints. Earl, thanks for this review. It helps me validate my decision to go with the Domino; it would have made me crazy trying to figure out the intricacies of the set up. I wanted to say what Willie said, but held off as I didn’t want to upset you on that price. I understand you have a need for really precision M&T’s, I’ve looked at your projects and they are just stunning pieces of furniture, but the price of this unit for what you get seems excessive. I had a similar debate myself in choosing between this and the Domino. I also looked at the Super FMT Jig but didn’t like the compromises in quality and it couldn’t easily do some of the types of M&T joints that I needed. I ended up going with the Domino and have been quite happy with it. I’ve recently embarked on a set of six dining chairs and I’m using a router and angled wood blocks to create angled M&T joints which is working fine for me. This is the type of joint that the Domino doesn’t do well (it can, just lots of setup and test cuts). I’d love you to re-review this in 6 months and let us know how much you are using it. I’ve made a lot of projects with my Domino that I otherwise wouldn’t have made and I’d be interested to know if you find the FMT equally useful. Owning both the domino and this, I can say that I will never use this again; I will be selling mine off soon. Although it works as advertised, the setup is more work than its worth to me. One another note, I ordered the Origin Shaper and it should allow me to perform the same function at about the same price point and includes a router in the deal.